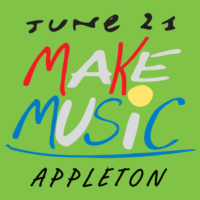 Make Music Appleton is a live, free musical celebration on June 21, the longest day of the year, with concerts on streets, sidewalks, and parks across the city. Make Music Day Appleton is part of the international Fête de la Musique, taking place in 800 cities across 120 countries every year on June 21. It is designed to celebrate music in all its forms and encourages people to band together to play free public concerts. In the U.S., Make Music Day is presented by The NAMM Foundation, and coordinated by the Make Music Alliance. This year, more than 65 U.S. cities are organizing Make Music Day celebrations, encompassing thousands of concerts nationwide. Stay tuned for a listing of our 2019 events! If you or a group are interested in participating please contact Katie at 920-831-4990, ext. 124 or via email Education@HeidMusic.com. If you are interested in participating or would like more information please contact us at Education@HeidMusic.com or at 920.831.4990. ext. 124. All content © 2019 Make Music Appleton, unless noted otherwise. Make Music Appleton is part of the Make Music Alliance.